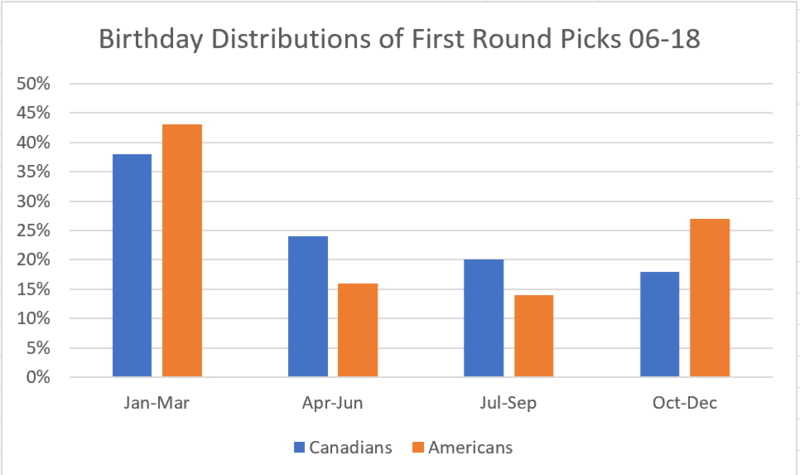 As a Canadian born in December, Drew Doughty’s chances of becoming a first round draft pick were slim. Malcom Gladwell’s book Outliers isn’t a hockey book, but it does open with a chapter about hockey players and ‘relative age effect’. The point the chapter makes is that players born at the start of the year are more likely to be successful, because they’re closest in age to the previous year’s eligibility cut-off in junior hockey. This quirk of fate means that players will get more attention from coaches and as such will develop into better players For more insight into this, and how nothing has changed since the book was published 10 years ago, I recommend you have a read of this article. The situation in junior hockey is as static as it’s ever been, but does the birthday advantage translate to the NHL draft? 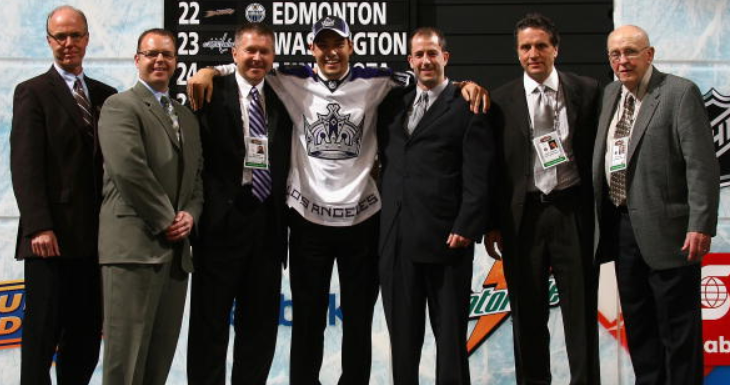 The research done focuses mainly on Canadian players, but in part one of this two part series, we’ll be looking at all the players drafted in the first round since the 2005 lockout. 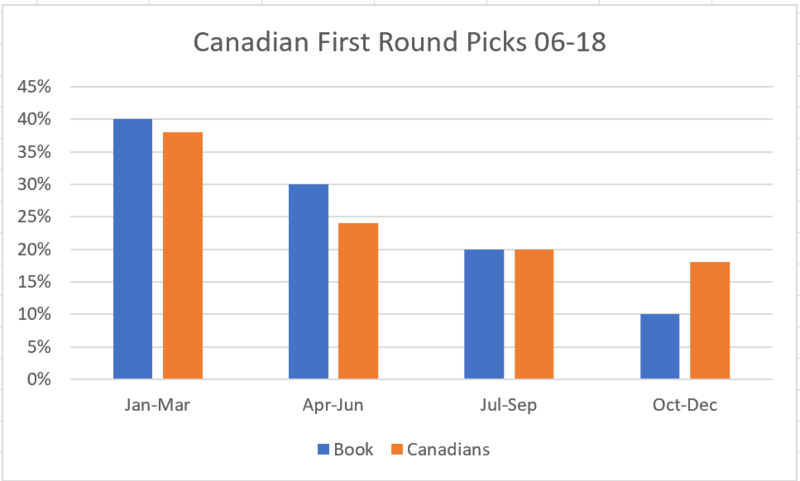 This will allow us to see if the pattern exists in players from north of the border, but also to compare these players against their American and European counterparts. FYI, Excel’s disappointing adoption of the Oiler’s colour scheme as their default has not escaped me. It’s slightly better news for those Canadians born towards the end of the year, but the bias still favours those born closer to January 1st. What about those from the 52 states of the USA? 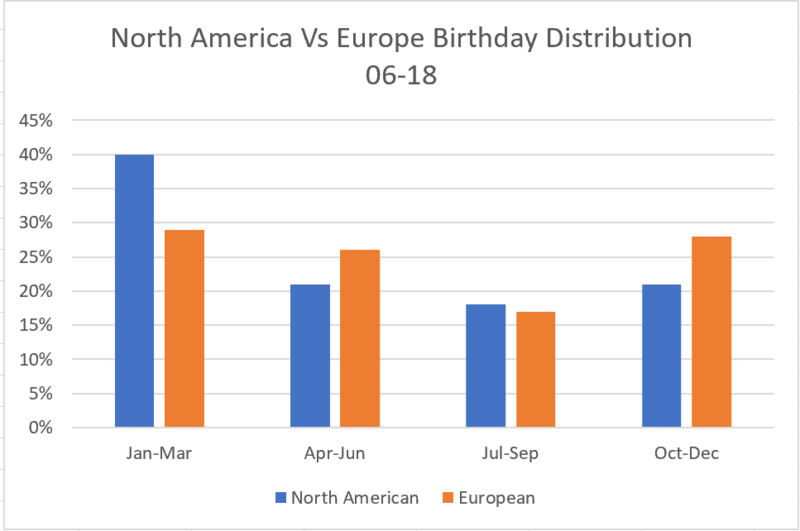 USA Hockey’s Junior program uses the same date cut-off, but with just 88 players selected, the sample size is less than half that of those from the great white north, but how do the birthdays compare? Why is relative age effect an issue? 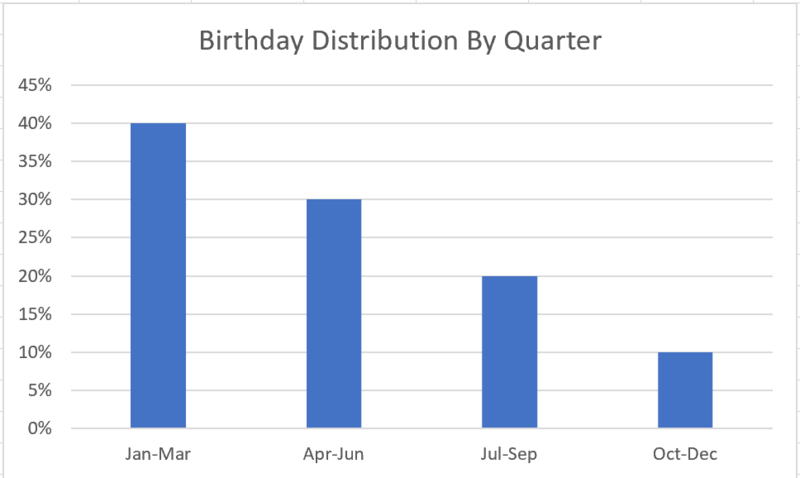 The perceived problem is that talented youngsters whose birthdays are towards the end of the year are less likely to get the development they need. Looking at how this relates to the draft, the bias toward the first quarter holds true, but American draft picks buck the trend when it comes to the last quarter of the year. Of course there are notable exceptions. Patrick Kane and Taylor Hall were both first overall picks, and along with notable early draftees Phil Kessel, Drew Doughty and Jack Eichel all have birthdays in October, November or December. Likewise Erik Johnson, Thomas Hickey, and Scott Glennie were all born in the first quarter of the year, but haven’t exactly gone on to have careers worthy of a first round draft pick. Is relative age effect something that ice hockey’s governing bodies need to work on removing? Or is it just a part of the game? Comment below or join in the conversation on Twitter!